Case in point. 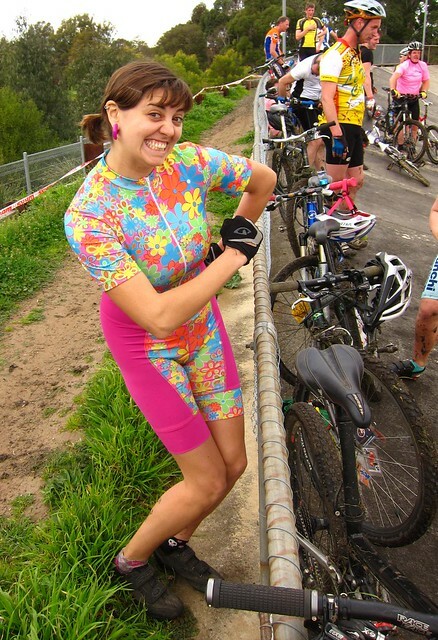 Helmet Lady gets all the way to the end of the Tour and then gets drunk the day before the time trial and is languishing in Wye River with a garlic press for an eyeball. She is dead with a camel in her mouth, so she says nothing about her boy Andy. She does not say, “ta” to Fabian, she is not grudgingly impressed with Contador, she doesn’t giggle over Lance’s wardrobe changes, she’s not saying sorry but not that sorry Cadel. She just lets it all slide and goes to PNG. Apparently there is a tribal war on and that is More Important Than Cycling and that sort of pomposity does not fly. Was all that affection faked? Mebbe. Mebbe not. I was very hung over. And – then after all that CX silliness. Where was Helmet Lady then? When the round up needed rounding? When there were few lady voices, just the sausage flavoured hum*, where was the dulcet tones of the dork saying, “thanks Nic and Blakey and Brendon and Sponsor and Sponsor and Northside Wheelers“? Was Helmet Lady sitting on her arse? Perhaps her fingers were broken and she was unable to shout RADELAIDE to Sam, or to say “pleased ta meet ya Ann Michelle”, “thanks for saving my chain, Emma”, “Jess, I loves your dirty hide”, “ChoongDeath, you make me laugh and, dammit Vicky Bianchi, I’ll be missing you”. Thanks for making the day lovely and the whole world a wee bit brighter. I kept myself clean, but now that I know it is possible I shall endeavour to bring more of my game face and less of my lame face. In part, I was. Or at least I was trying to. Having recovered (only vaguely) from my service provider crush on Dom at First Place Osteo, and having failed to follow up on all of the adjustments he recommended, I was not sitting on my bum. Mainly on my fanny. There’s a lot I’ve been meaning to get off my chest. Things I wanted to say. Stuff about that damn bike share scheme. About the upcoming Bike Fest, little things I love about Melbourne. That nice shop that Mick’s wife has opened up that I want to go to. Which doesn’t have a damn thing to do with bikes, but seems rather beautiful all the same. I’m sure I’ll get around to it eventually. * Some of my best friends are sausages. And these are friendly sausages that I like. Vegan sausages.